Mathematics holds an essential, ubiquitous presence in the education sector, as do ongoing explorations of its effective teaching and learning. Written by leading experts on mathematics and mathematics education, this book situates issues of student thinking and learning about mathematics within the broader context of educational psychology research and theory and brings them to a wider audience. 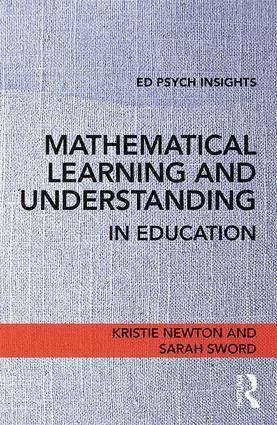 With chapters on knowing and understanding mathematics, mathematical habits, early mathematical thinking, and learning mathematics, this concise volume is designed for anyeducational psychology, mathematics education, or general education course that includes student learning in the curriculum. It will be indispensable for student researchers and both pre- and in-service teachers alike. "Through personal anecdotes, mathematical explanations, helpful teaching and learning tips, and clear and understandable descriptions of psychological and educational research, Newton and Sword have written a delightful book that is readable, informative, and enlightening. Anyone interested in mathematics teaching and learning—from undergraduate and graduate students, to preservice and inservice teachers, to parents, and school administrators—will find a lot to like in this book." "This book is in a rarified genre that is so desperately needed in mathematics education: a cross-disciplinary study of learning and understanding in mathematics. The authors, who are expert teachers, expositors, and scholars, synthesize the perspectives of mathematicians, educational psychologists, and mathematics educators. Especially noteworthy are the many examples, all of which are non-technical but show the essential ideas in each of the three disciplines." Kristie Newton is Associate Professor in the Department of Teaching and Learning at Temple University, USA. Sarah Sword is Senior Research Scientist at Education Development Center, Inc.